The printing method of the gravure printing machine is referred to as gravure printing, and is one of the four printing methods. Gravure printing is a direct printing method that directly imprints the ink contained in the pits of the gravure printing machine onto the substrate. The shade level of the printed image is determined by the size and depth of the pit, if the pit is pitted. Deeper, it contains more ink, and the ink layer left on the substrate after embossing is thicker. On the contrary, if the pit is shallower, the amount of ink contained is less, and the ink remaining on the substrate after imprinting The ink layer is thinner. The printing plate of the gravure printing machine is composed of a pit corresponding to the original image and a surface of the printing plate. During printing, the ink is filled into the pits, the ink on the surface of the printing plate is scraped off with a doctor blade, and there is a certain pressure contact between the printing plate and the substrate, and the ink in the pit is transferred to the substrate to complete the printing. As a kind of printing tool, gravure printing machine has the advantages of thick ink layer, bright color, high saturation, high printing durability, stable printing quality and fast printing speed in printing and packaging and graphic publishing. It occupies an extremely important position. From the application point of view, in foreign countries, gravure printing is mainly used for fine publications such as magazines and product catalogs, packaging printing and printing of valuable securities such as banknotes and stamps, and also applied to special fields such as decorative materials; Printing is mainly used for flexible packaging printing. 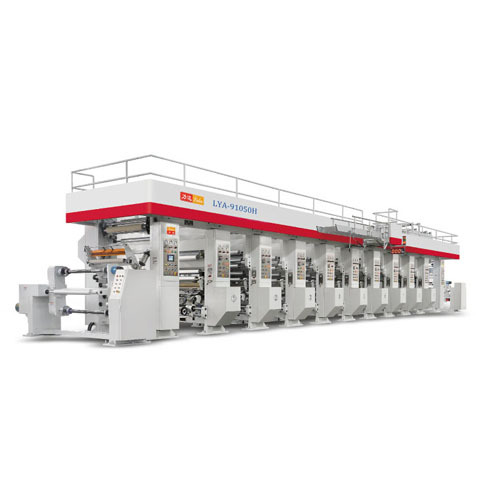 With the development of domestic gravure printing technology, it has also been widely used in paper packaging, wood grain decoration, leather materials and pharmaceutical packaging. Of course, gravure printing machines also have limitations. The main disadvantages are: pre-press plate making technology is complicated, the cycle is long, and the plate making cost is high. Due to the use of volatile solvents, the harmful gas content in the workshop is high, which is harmful to workers’ health; The treatment required by the printing practitioners is relatively high.